...You can pick from 31 shades of leather and eight types of Alcantara, plus 30 stitching, 18 carpet and 11 seatbelt colours. ...Foam inserts protect each part. Building each car requires assembly of more than 1800 parts. ...each end of the car in hoses as wide as the spray lance used by firefighters and travels at an even higher flow rate. Hungry tourists ate while ogling the Lamborghini Countach, the Ferrari F50 and the Bugatti Veyron. Except, of course, the latter isn’t Italian. Founder Ettore Bugatti was born in Milan, but every car he designed came to life in an Alsatian town named Molsheim. This tradition continues today with the Chiron, the latest torchbearer of the brand’s heritage. Bugatti calls its glass-walled factory ‘the Atelier’. The production process relies exclusively on human hands, not algorithms and software; there is not a single robot present inside the facility. It helps that the company doesn’t manufacture its own parts. It sources everything from European suppliers. The carbonfibre monocoque comes from Dallara, AP Racing supplies the brake calipers and Sparco manufactures the seats. Highly trained mechanics spend about a week assembling the quad-turbocharged, 16-cylinder engine in a special Volkswagen Group factory. Bugatti orders the parts required to make a Chiron about three months before production begins. It’s then placed on a dynamometer, bolted to the ground and driven at up to 124mph. Production boss Christophe Piochon told Autocar that the company had to order a new dynamometer able to cope with the Chiron’s monstrous horsepower and torque outputs because the unit used to test the Veyron wasn’t up to the task. The firm channels the excess electricity produced while testing each car directly into Molsheim’s power grid. Charge your phone in a local brasserie and the power it draws could come from a Bugatti’s four wheels. 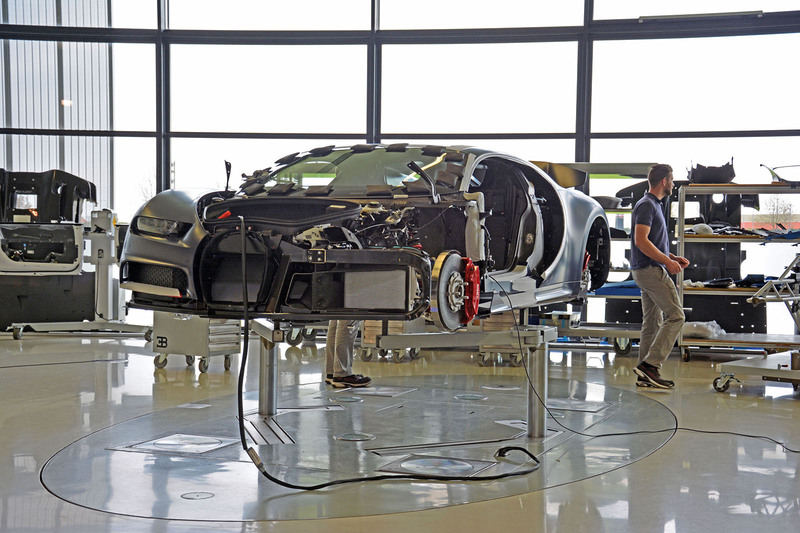 Workers spend about three days installing and adjusting the carbonfibre body panels, which Bugatti receives pre-painted. The Chiron is then battered with monsoon-like rain to check for leaks before getting a full interior. It’s done after this step but not yet ready for its new owner. Every Chiron needs to complete two test drives on public roads. During the first test, the car leaves the Atelier and drives down to the picturesque town of Colmar. 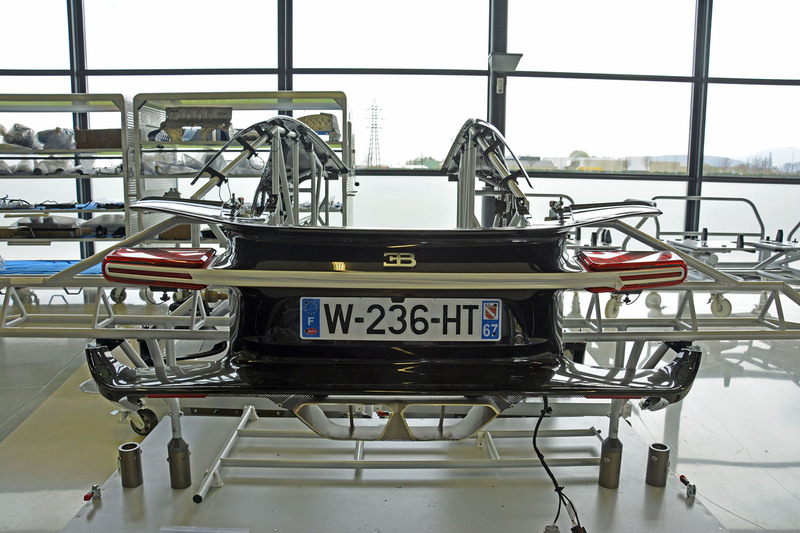 The airport there lets Bugatti test its cars on its runway between take-offs and landings. Test pilots communicate with the control tower to know when it’s safe to sprint down the runway at nearly 200mph. Following the high-speed jaunt, the car cruises back to Molsheim at a more sensible pace. After receiving new fluids, it embarks on a second, shorter test drive the following day. With the drivetrain signed off, each Chiron spends about three days in the cleaning and polishing station. It then goes through a light tunnel, where a quality specialist inspects every square inch of the car for six hours to identify any and all imperfections that need to be fixed. It goes back to the cleaning station before taking a final trip to the inspection station. 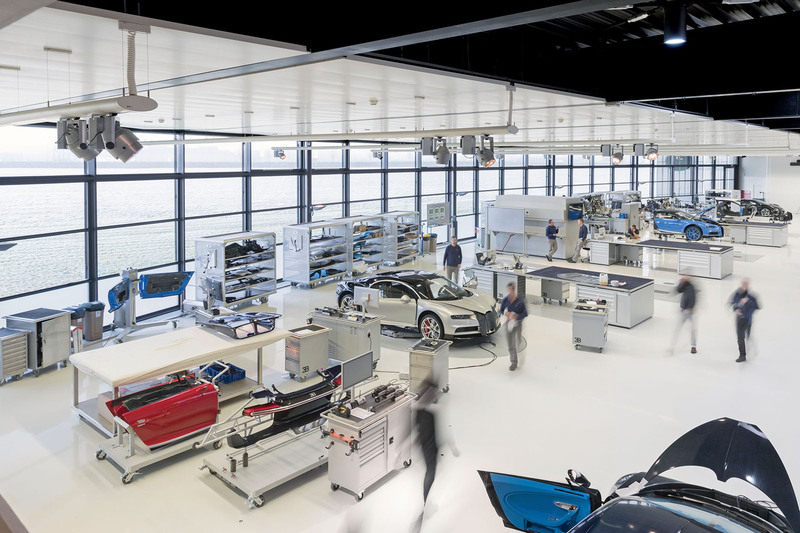 The car receives the green light for delivery at the end of this meticulous process. By that point, it will have spent about two months in the Atelier, occasionally breaking the silence of Alsace’s wine-making countryside with its bellowing 1479bhp engine. The hand-built 16-cylinder engine is tested on a dyno for eight hours before making its way from Germany to the Atelier. Production starts by attaching the engine to the seven-speed dual-clutch automatic transmission to make a single unit. Installing the carbonfibre body panels over the monocoque takes about three days. This photo shows the three radiators tucked behind the front end and the air duct next to each headlight. The ducts direct cooling air to the front brakes. The Chiron stands out from the majority of cars on the market today because it lacks a screen on the centre console. Instead, two high-resolution screens on either side of the speedometer display vital information about the car and its surroundings. Bugatti tests every Chiron on public roads for nearly 220 miles. The front end is wrapped in film to avoid being damaged. For the same reason, finished cars don’t get their own wheels or underbody cover until they return from the first test drive. Fourteen ultra-light titanium screws attach the monocoque to the rear portion of the car. All told, about 1800 bolted joints hold the Chiron together. Workers rely on a set of digital torque wrenches to ensure each one is as tight as it needs to be. In some parts of the Chiron’s body, Bugatti fills the space between carbonfibre walls with foam and an aluminium honeycomb structure. Inserts made with aluminium secure bolts when needed. These materials help keep the Chiron’s weight in check. 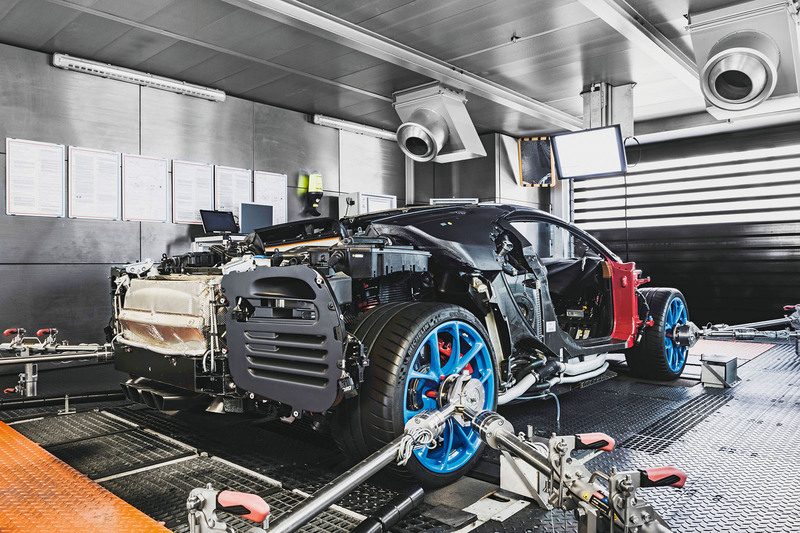 As soon as it’s drivable, the rolling Chiron chassis is aligned and workers calibrate electronic functions such as the traction and stability control systems. It’s then placed on a dynamometer and driven for nearly 40 miles at speeds of up to 124mph. Quality specialists spend hours detailing each car after it returns from its two test drives on public roads. They look for even the tiniest imperfections in the paint or in the leather. The Chiron is only eligible for delivery once it’s absolutely perfect. would be a fascinating tour of the Factory just to see the meticulous attention to detail. this richman's toy, as was the case with the Veyron? Roughly thar car costed more than twice the price it was sold for, which comes down to every other customer of the VW conglomerate picking up the tab for people who can basically afford to buy such a car.